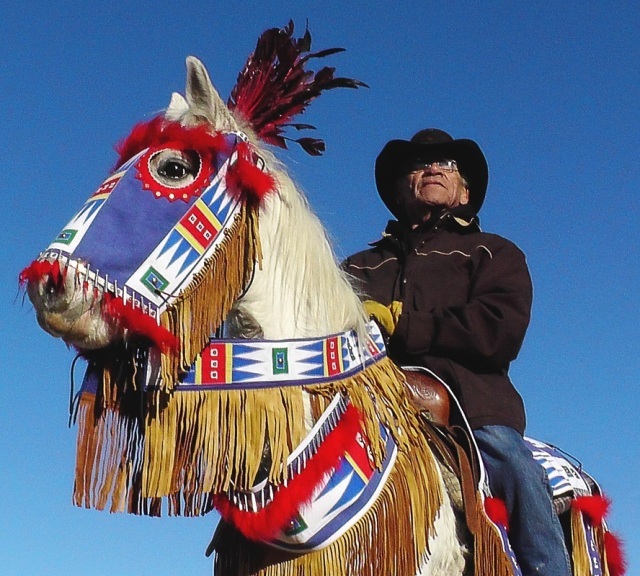 Peter Lengkeek of the Crow Creek Dakota Tribe can barely recall the story of his ancestors escaping annihilation on the backs of horses without breaking down. But theirs is not a sad story. It is triumphant. Filmmakers Jim Cortez and Keith Brave Heart set out last winter to tell a story that would document the reviving connections between the tribes in the Dakotas and surrounding regions with their long lost relatives, the horse. The tribes are putting together programs that are both innovative, and yet at their heart, very connected to centuries of tradition and spiritual practice. The film first intended to document just a single program, the Tiwahe Glu Kini Pi (Bringing the Family Back to Life) program at Sinte Gleska University. The program provides mental health services for Lakota youth 3-21 with serious mental health issues and their families. Among their primary services is an equine assisted mental health therapy program. But Brave Heart ultimately felt the need to expand his story to include multiple tribes and programs. The extended seven-minute trailer provides a preview into the work– intimate portraits of empowered youth, troubled adults regaining their footing in life alongside their equine partner, and everyday people finding their voice. For many, that voice resides in the history of their shared past with the horses, and they are rediscovering that as a cultural collective. Despite the expenses involved with any film project, Brave Heart and Cortez kept costs minimal, utilizing resources from the Sinte Gleska University and then Tiwahe Glu Kini Pi program funded through a Cooperative agreement with the Substance Abuse Mental Health Services Administration. (Brave Heart explains that the work was “passion driven” for the two of them) and secured necessary funding with the help of SGU TGKP Program Director Marlies White Hat. Because of this, they plan to make an online version of the film available for free. There will also be a “fully loaded” version that supporters can obtain through a donation, with funds going directly towards support of the SGU Tiwahe Glu Kini Pi Equine Therapy Program and Horse Ranch. The film is in its final finishing stages, and will be submitted to film festivals around the world and premier at the end of this year. For more information, and to follow the filmmaker’s journey to the premier, visit their website www.horsenationfilm.com and/or their Facebook page. You can also learn more about the amazing work being done at the Tiwahe Glu Kini Pi Center on the Rosebud Reservation in South Dakota by visiting their Facebook page. Finally, our sincere thanks to Jim Cortez and Keith Brave Heart for reaching out to share their film, and to Program Director Marlies White Hat for her assistance on this story.